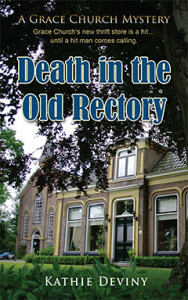 Death in the Old Rectory ($13.95, 168 pages, ISBN: 978-1-60381-343-3) is the second book in Kathie Deviny’s clerical/cozy mystery series set in Grace Church, an Episcopalian parish. A charming young man is killed while volunteering at the church’s new thrift store, which leads his friends and colleagues to conduct their own investigation. “I found myself enjoying Death in the Old Rectory so much that at times I found myself laughing out loud because each character brought personality to the story. I visualized the scenes as if watching a live performance where each character played their part extremely well. As Detective Joyce and Officer Chen, along with Lester (an unofficial security and criminal expert), begin to uncover the clues of the murder, the fun and adventure begin.” Read more…. “I specifically fell in love with Nick, you will see why when you read the book, but he seemed like the glue between the thrift store, the food pantry and the church plus all the people. I was devastated when he was murdered and even though I had to step away for a bit to collect myself, I went right back to the story. I was on a mission!! I was right alongside Father Robert, Terry, Mae, Mrs. Evans and the rest of them trying to figure out who the murderer was. I highly recommend this book to everyone, religious or otherwise. I also suggest picking up the first book, Death in the Memorial Garden, and put the third one on your ‘to read’ list. I know it’s on mine!! !” Read more…. 5 Stars: “Kathie Deviny has written an interesting mystery with red herrings galore…. The book is pretty engaging and a fun puzzle.” Read more…. “I love this series as you meet various parishioners and watch various relationships while learning history of the characters and their connection to Nick…. Such a great story, and I was stumped on who the murderer was until the last page. Can’t wait to see what is next for Ms. Deviny.” Read more…. For many years Father Robert has called the old rectory at Seattle’s Grace Church home. No longer. An enterprising volunteer has come up with a scheme to convert it into a thrift store. With great reluctance, the priest moves to a condo, realizing that the struggling Episcopal parish needs the revenue. As predicted, money is soon rolling in. That is, until disaster strikes: one of the employees, a charismatic young man named Nick, is killed execution-style. Though well loved, Nick had a criminal past. Did his past catch up with him, or was he simply in the wrong place at the wrong time? Detective Joyce Hitchcock and Officer Raymond Chen are on the case, and once again their efforts are bolstered by the colorful staff and members of Grace Church—Father Robert himself, his fiancée Molly, Deacon Mary, manager of the food bank Terry, Lester the formerly homeless sexton, Daniel the organist, Arlis the church secretary, and senior volunteers Lucy and Mae. Other incidents follow—an explosion, vandalism. The already dwindling congregation is being scared away, and Grace Church may soon be history. Meanwhile Nick’s friends and colleagues can’t help but wonder: will the killer strike again? After retiring from a career as a “government bureaucrat” serving primarily in the criminal justice system, Kathie Deviny studied creative writing. Her essays have been published in the Seattle Times, Episcopal Life, Cure magazine, and Faith, Hope and Healing by Bernie Siegel. Kathie and her husband Paul divide their time between California and Western Washington. Click here to find Kathie online. At 2:55, Adele Evans came down the stairs from her office, dressed in a denim pants suit and white sneakers. Her gray hair was in its usual French twist, and her stern aspect was somehow made more so by the scarlet frames of her glasses. She scanned the shop. Everything was tidy, as she liked it. Mae was rehanging women’s clothes on their racks. Nick was bent over the counter tallying the day’s proceeds. “What was the take?” she asked. Mrs. Evans turned on a silent heel and marched out the front door, slamming it behind her. At 3 p.m. sharp, Nick and Mae shooed the last customers out of the shop—the ones who’d snuck back in after Lester and his shovel left. Mae brought in the sandwich board from out front and locked the door, while Nick tidied up the counter. Then she went into the kitchen to empty the coffee pot and use the adjacent facilities. The last thing Nick saw was the gun pointed at his head and the familiar face behind it.